The perfect chocolate bundt cake with a mascarpone filling and a hanful of fresh strawberries all covered with a pistachio and white chocolate ganache. Does this seem all complicated well guess what it is not ! and it is perfect for any occassion from a simple family dinner dessert to a birthday party cake . I started a poll last week for my dear instagram followers to know what would they wish for as new recipes and apparently people just can’t get enough of chocolate layer cakes and so came the red velvet suggestion . But since i do not use any artificial coloring in my recipes and tried to make a natural red food coloring for this recipe out of beetroots and failed , the red velvet bundt cake ended up beeing a non red - red velved so we are gonna simply call it a chocolate bundt cake to avoid any further confusion. At this point you may ask what are then the differences between this chocolate cake and a red velvet cake , well nothing except the coloring ! a red velvet is basically a light in cocoa chocolate cake to which we add some red food coloring to get that nice and vivid red color so you get the same chocolate cake taste but with a different visual . It is a typical southern American cake that used to be famous for christmas and valentines days especially due to the rich color and the fancy " velvety" name of it . Anyway i promise you i will retry to find a food coloring recipe that works and make you a beautiful red redvelvet cake next time . Meanwhile enjoy this chocolate cake . I have seen a couple of videos of filled bundt cakes on social media and i loved the idea , its a perfect way to desguise a layer cake and creat that surprise effect when you cut into it so this makes a perfect birthday cake ; plus it lasts a bit longuer and stays moist inside for a few more days in your fridge . This cake was a success among our friends when i made it they loved it and got compliments for it beyond what i expected . I filled my bundt chocolate cake with a light mascarpone whipped cream and some whole fresh strawberries to get that cool cross cut of the fruits when you cut into the Bundt cake . Then to make it even fancier i covered the top with a white chocolate an pistachio glaze to compelent the freshness of the filling . want to have the full recipe well i won't make it longuer for you enjoy the full recipe and as usual don't hesitate to ask me any question in the comments section and on social media . Mix all the wet ingredients in a separate bowl and start adding them slowly while mixing to the dry ingredients . In a preheated 180 C oven ,bake the bundt cake for 40 Min or until the tooth pick comes out dry and clean . Let the Bundt cake cool down , then cut it in the 2/3 horizentally . Meanwhile , whisk the heavy cream and start integrating the sugar , Mascarpone cheese and vanilla extract until it becames homogenous and creamy . Using a tea spoon creat a well around the center that will be filled with the mascarpone cream and strawberries. Fill the center then close the bundt cake and set it in the fridge so the center sets . On a bain marie melt the white chocolate , pistachio butter then the heavy cream . 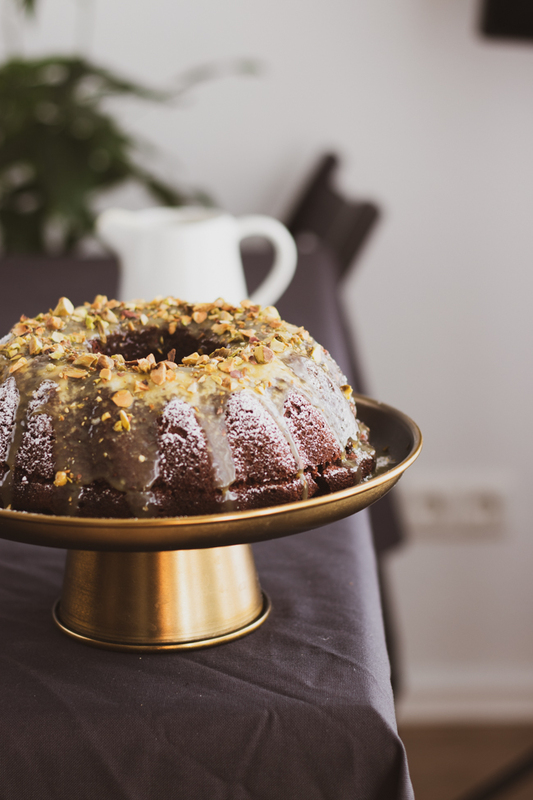 Get your cake out of the fridge and glaze it with your lucious pistachio glaze.